Today's review is about Katie Ashley's new release! 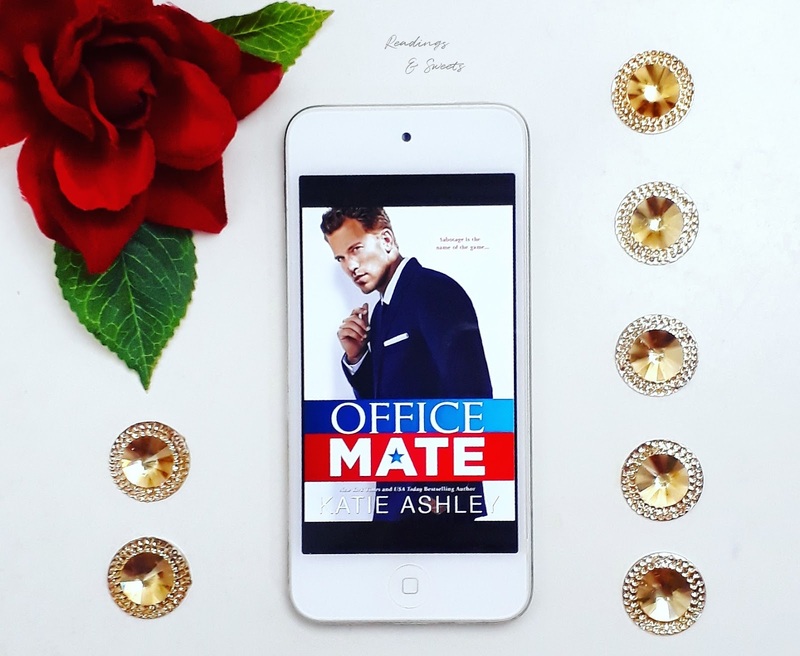 'Office Mate' tells us the story about Isabel, a woman who's ready to take over a new and higher position in the company she works for, but sees all her plans going south when Thorn Callaghan, the President's soldier son, hijacks her dream job. Isabel had her entire day set and planned. After years of hard work and sacrifice, she'd finally be promoted to vice president of her department! But well, things kind of goes south right in that morning... First, she's showered with hot coffee by some jerk who didn't look where he's going, then she almost broke her hand punching that very same jerk in the nose because he started hovering over her breast area trying to 'help her get clean'. Since his dad was elected President, Thorn had to leave his military career because now with a target on his back puts not just him in danger but also his men's security. Now that he has put away his uniform and suited up with an Armani, it's time to conquer new fields... But his adaptation wasn't going so smooth as he thought it would be. Starting with the fact that after so long in open spaces, the desert heat and under extreme stress, Thorn is now stuck in an office and having to deal with his anxiety. Besides that there's Isabel's constant presence ... The woman from who he has hijacked the position in the company and who was determined to make his days unbearable with her intelligence, beuty and ironic mouth. 'Office Mate' is a smooth reading and, between a lot of laughter, develops really well. So well, that when you notice, you're in the last page! I must confess that when I started reading the book I was expecting something kind of a cliche, but guess what?! Katie Ashley brings us something different and really fun! And when I say fun, I mean by all the tricks Isabel plays on Thorn with her sabotages. Laughters are more than guaranteed! During the book the author shows us glimpses of why Isabel is the way she is and why she is so concentrated on her career. Isabel is a strong character that shows the reality of a lot of working women. About Thorn... Well, I can say that this is probably the first time in history that we don't have a male character being a real life jerk, womanizer or worst. Did I hear an amen?! Ok, maybe a little bit jerk, but still... Thorn's life changes completely in little time, and for Thorn it was hard to adapt to his new reality. I liked Thorn's character because he's different from all the others we have, not just because he's the Presindent's son, but for the fact that he shows the reality of so many soldiers who left the army and need to go back to life as a civil and the struggles they have to adapt. A good read, for sure! 'Office Mate' is also available on Kindle Unlimited!